Buko Pandan Salad made with gulaman cubes, tropical palm fruits, shredded young coconut in sweetened cream. Rich, creamy, and loaded with pandan flavor, this Filipino classic dessert is sure to be a crowd favorite. Two new recipes back to back in two days! Woot hoot, I am rocking it! 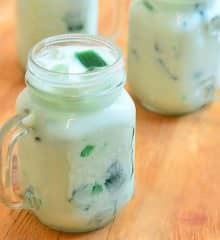 Buko Pandan is a type of Filipino cold dessert made of jelly cubes, young coconut, and sweetened cream infused with pandan or screwpine flavor. Although the above three are the standard ingredients, tapioca pearls or sago, kaong, and nata de coco are commonly added as well. This tropical salad is usually enjoyed as a snack or dessert and often made for holiday parties and other special occasions. I learned how to make this Filipino dessert on one of my yearly trips to the Philippines. There is a popular restaurant in Tarlac that specializes in merienda and I was so enamored by their buko pandan salad that I would pass by the restaurant every day of my three-week vacation to buy a large container to-go. Imagine my delight when one of my aunts claimed she makes the best buko pandan salad and that for a little bit more than what I pay for the small tub at the restaurant, I could have a bucketful in the refrigerator good to enjoy for a few days. And she sure wasn’t lying. It was the best I’ve ever tasted! Her secret? The agar-agar or gulaman is cooked in coconut juice instead of water. How Do You Make Buko Pandan? Buko pandan salad is so easy to make, the hardest part of the recipe, really, is waiting for the gelatin to set! I use agar agar bars or locally known as gulaman. Although they require pre-soaking and longer cook time, they yield a firmer texture and need no refrigeration to set. Make sure to finely shred the gulaman bars and soak until very soft so they’ll dissolve faster. You can substitute gelatin powder such as Knox or Alsa, if you like, and prepare according to package directions. Soak the agar agar in coconut juice and infuse the mixture with a few drops of pandan extract to heighten flavor and aroma. If using fresh screwpine or pandan leaves, tie a few strips into a knot and add when boiling the agar. Remove and discard when enough flavor and color are extracted. Once all the ingredients are combined in a bowl, I like to perfume the mixture and deepen the green color with additional drops of pandan extract. Buko Pandan Salad made with gulaman cubes tropical palm fruits, shredded young coconut in sweetened cream. Rich, creamy, and loaded with pandan flavor, this Filipino classic dessert is sure to be a crowd favorite. In a pot, combine agar agar and coconut juice and soak for about 30 minutes. Bring to a boil over medium heat and cook, stirring regularly, until agar agar is melted. Add sugar and stir to dissolve. Continue to cook for about 10 to 15 minutes or until agar agar is completely dissolved. Add 2 drops of pandan extract and stir to combine. Remove from heat and carefully pour into a flat dish. Allow to cool until gulaman is set and hardened. Cut into 1/2-inch cubes. In a large bowl, combine gulaman, young shredded coconut, nata de coco, kaong, table cream, and condensed milk. Add about 2 to 3 drops pandan extract and stir to distribute flavor and color. Chill for about 1 to 2 hours. Serve cold. Hi! Can I use coconut juice in can instead? Hello, how long does it take for Buko Pandan to spoil? Hello Lalaine, I just wanna say THANK YOU for sharing with us your love and expertise in cooking. HAPPY HOLIDAYS! Please, I will share your recipe, video and pictures. Will acknowledge your site. Thank you. I appreciate that you liked my recipes but unfortunately, I don’t allow my recipes/videos/pictures copied and pasted on other blogs even with credit. You can of course cook and take your own photos and credit me as the source or inspiration for the recipe. Thank you for your understanding. coconut juice as in buko juice? thanks! why coconut juice? Can I just use water to cook the agar agar. What kind of coconut juice? Hello po! Happy New year! Thanks for the recipe! 🙂 just wondering why your measurements for the agar agar stick is different than the packaging? The pkg says 1 stick 2 3/4 water (or coconut juice). Will it turn out different? It depends on the brand and the amount/size of agar agar bar. The one I used was .70 ounce. Also, I find 3 cups amount to yield the texture I like. Feel free to adjust the measurements based on the packaging of the brand you’re using. still adding sugar for the gulaman? Wouldn’t it be too sweet since it has already 1 can of condensed milk? Ilang oz po water for gulaman? can i use the fresh leaves of pandan…. You are absolutely right… delicious and addictive! Our families favourite Filipino desert… For us non Filipinos can you explain some of the ingredients in English please, like gulaman and kaong? I’m trying your recipe right now,gonna update you as soon as my mom took her first bite, she loves buko land an………bet your tips will make it more heavenly….thanks!!! another recipe for my son’s birthday! wow! Wow, I never thought i’d use kaong in buko pandan, though my recipe calls for sweet corn and sago instead. I’ll try to add some nata de coco next time and infuse some flavor in the gulaman. What is the measurement for gelatin powder like Alsa gulaman? One package (about 3 ounces) will need about 1 1/2 cups water/coconut juice, this will yield a pretty firm jello. Just add another 1/4 cup if you want your cubes a little softer. Got to try this , now using coconut juice..tnx for sharing..buko pandan is my fave. good for ilang persons po????? reply pls….. bukas po kasi ang birthday ko…..
Good for 10 to 12 servings. What Is table cream? same as Nestle cream? Yes, it is the same as Nestle cream. ano po yung agar agar? wow.. ang sarap… wanna make one for my birthday! !